Elements of yesteryear meet the 21st Century in the beautiful secretary desks below from Brandenberry. 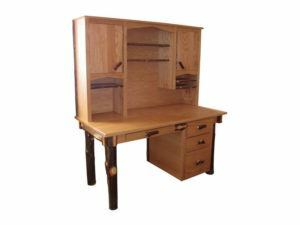 Amish artisans custom-build each desk of solid hardwood. So the desks are incredibly functional, sturdy and durable. Check them out, and see which one is right for you. Sturdy construction and rustic elegance meet in the Hickory Secretary Desk. 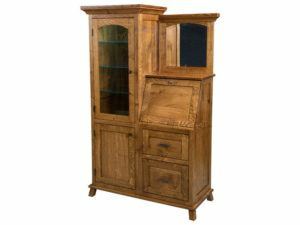 Beautiful construction highlights the Hickory Secretary Desk with Hutch. 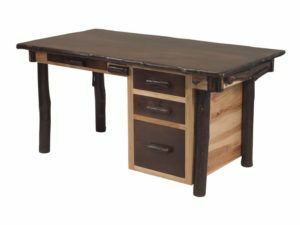 Solid hardwood construction and a timeless style blend artfully to create Brandenberry Amish Furniture’s lineup of secretary desks. They come with quaint, old-school features like flip-down work stations, cubbyholes and small storage drawers. And these elements add character and a nostalgic feel to your home. Amish artisans painstakingly handcraft each desk. And they use solid hardwoods. Like oak, maple and cherry. So the secretary desk you choose will be sturdy. In fact, with proper care, the desk of your choice may well become a treasured piece in your home for generations to come. Also, if you have questions, feel free to talk with one of our trained staff. 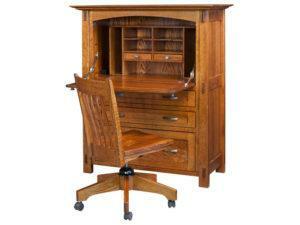 We’ll help you create the antique secretary desk or modern secretary desk of your dreams.